How’d you find out about N24HC? My friend Mike told me about it very soon after we first met. For a long time, I was not interested, but Mike persisted, I met others who also raved about the ride, and I finally decided to give it a try. How’d it go the first time you rode? I fully expected that I would only do this once. Training for my first 24 hour ride was very hard. I was having some neck problems, and the long training rides were killing me. I knew I had to get them resolved, so I bought a new bike that fit well, I rode like crazy, braced myself for the pain, and rode. I had the time of my life! I met up with a guy I’d seen at another ride we spent a lot of time together, pulling, drafting and basically keeping motivated. We rode all the way to 232.5 miles, a new PR for both of us. And I’ve come back two more times. I do as many early-season club training rides as I can, and I frequently take long solo rides, too. A thing I do that most folks don’t is two times in the winter, I stay up for 24 hours. The day is spent doing the things you do on a Saturday, and then I spend all night working out in one way or another. I think this trains your brain and nervous system on what to expect. What should new riders know? Position is everything. You have to be comfortable on your bike. Use a good cream while you’re at it. Nutrition is crucial. You’ve got 24 hours; eat – and especially drink – a lot. Dehydration and heat stroke are lurking nearby. Attitude is everything. Have fun, be determined, and remember that this is a challenge, not a race. Keep smiling and it will go well. This event is phenomenal. 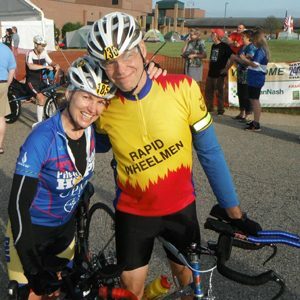 I ride several big rides each year, and the rider camaraderie, the ride’s organization, and the positive smiling volunteers (even at 4 am), all combine to make this ride so engaging, even addictive. 2016 is my fourth year, and I hope to see you there!